Google’s April Fools’ Day joke was supposed to be a mic drop, but ended up as a flop. 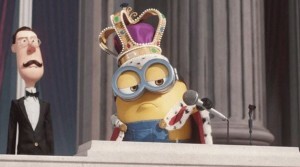 On Friday, Google announced “Gmail Mic Drop,” a new option on the send button that attaches to your email a minion from the “Despicable Me” movies dressed in royal garb and dropping a mic. But, the prank backfired the same day when the mic drop made it impossible for email users to see any subsequent replies. On Twitter, Gmail users were outraged, especially when, as seen in one example, an animated GIF of the yellow creature punctuated an email about funeral arrangements. In the Gmail Help Forum, users responded to the mic drop with confusion and frustration. “Seriously Google? You mess with peoples’ email like this. I use gmail for my one-man business. I can’t afford for you clowns to mess around with my business,” wrote one user on the forum. “I wish Mic Drop would Drop dead from my gmail page,” another wrote. Others claimed that the mic drop was destroying their professional rapport. “So I’ve been going back with a potential employer all week and last night sent a critical follow up email and accidentally clicked ‘Send + Mic Drop.’ Not only am I mortified of the mistake, but this could potentially cost me my dream job,” one user wrote. Google responded to their mistake on their official blog. The company said the feature was turned off to avoid more headaches for Gmail users. Left: Google removed its April Fools' Day email feature after it backfired.